Some thoughts to evaluate your horses hooves. Healthy horse hooves are the result of sensible nutrition; a living environment and work schedule that encourages lots of movement; regular & consistent balanced trims; and genetics to some degree. Stacy welcomes the opportunity to discuss your horses' feet! HEEL FIRST LANDING increases expansion of the hoof and stimulates the blood flow of the inner hoof structures. It improves the shock absorbing capabilities of the hoof and enables the navicular bone to function correctly. A HEALTHY FROG with an open central sulcus (cleft in the center of the frog) is a great shock absorber; acts to protect the inner structures in the foot; and is less prone to infection. BALANCE prevents stresses to the hoof and the entire body. A correct trim balances the hoof capsule to the inner structures, particularly the coffin bone (the bone inside the hoof). ABSENCE OF FLARE indicates a strong, healthy attachment of the hoof capsule to the the inner laminae. It is an indication of balance too. THICK SOLE and HOOF WALL provide protection for the inside of the foot. Lots of movement, correct diet, and genetics to some degree - develop with correct movement creates a healthy hoof. A TOE FIRST LANDING causes pain in the back of the foot. This can eventually lead to damage of the navicular bone. 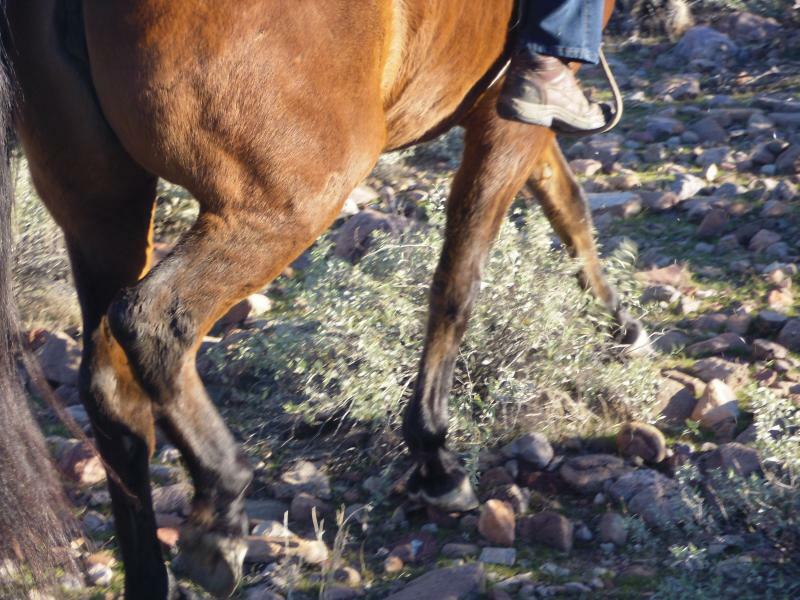 Toe first landing reduces the hoof's shock absorbing capabilities. A SMALL OR THRUSH INFECTED FROG provides little shock absorption or protection to the foot and can be very painful. Sometimes the thrush in the frog is only evidenced by contracted heels, heel or frog pain, and/or a toe first landing. IMBALANCES can cause joint alignment problems in the legs and eventually affect the entire body. The hoof is the base for the rest of the horse. If hooves are not balanced, even an otherwise perfect horse will be misaligned in the joints above that hoof. FLARE indicates a weakened attachment of the hoof to the coffin bone. This is evidenced by stretched out white line and diverging angles of the outer hoof wall. Excessive flare can lead to demineralization of the coffin bone. THIN SOLES and HOOF WALLS can be the result of lack of movement and proper stimulation to the foot. Flat soles are generally VERY THIN, sometimes as thin as 1/16". Laminitis and Founder are painful pathologies that require prompt attention. Many times diet & lifestyle changes for the horse are required immediately.